Technically these should be the 2013 Oscars right?…I mean…these awards are for movies released in 2013. This always confuses me. I have to say that some of my favorite moments of last night’s show were not the fashions. Some of my favorite moments were a few of the heart felt and well delivered acceptance speeches that we were treated to ( without annoying music cutting them off I might add…my thanks to the academy). Not only did these actors express their gratitude but many of them touched on personal and social issues that made what could have been a trite and generalized speech into a tribute to others and a call to action on a few social issues. It was really lovely to hear and see. Now…on to other things that were lovely to see…and perhaps a few that were not. This was “hands down” my absolute favorite. Glamours, chic, elegant…I could go on and on. She owned the red carpet in this amazing and what appears to be custom Christian Dior gown. Kate Hudson in Atelier Versace. Loved, loved, loved this look on her. Sandra Bullock in Alexander McQueen. Adored this look on her. She looked regal. Jennifer Lawrence in Dior…and notably…one of the very few to wear red on the red carpet. And….my favorite not seen on the red carpet but at the Oscars dress…Sally Fields in Randi Rahm. Talk about grace personified. Beautiful!! There were many gowns that I adored last night. There were also a few looks that left me wanting…and sadly they were on some ladies whom have stunned in the past on the red carpet. Anna Kendrick in J Mendel. The mesh cumber bund with beaded red stars…that was the kiss of death on this number. You know there is a problem when people are saying the back of the gown is way more interesting than the front. 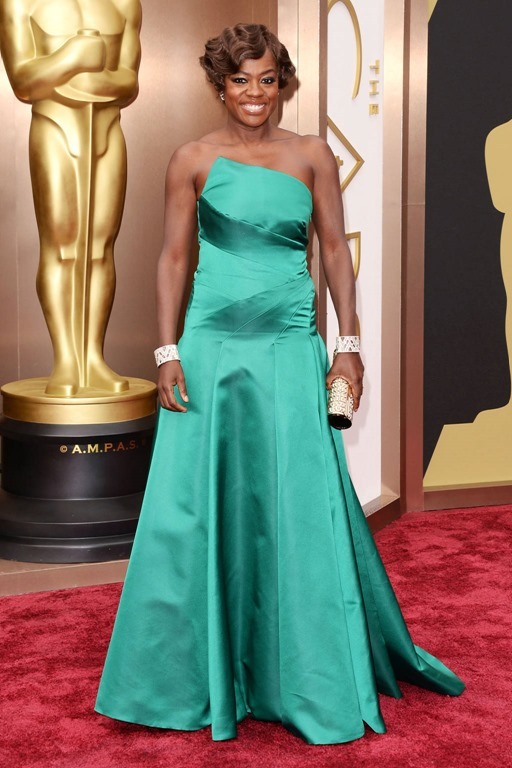 Viola Davis in Escada. The fit was off on this one. Not her best look. It pains me to say this but…Anne Hatheway in Gucci. I can only imagine the screams that curdled the air in the control booth when she stepped out on the stage to give an award. The mirrors on the front of her dress caught every single light and reflected it back…into the audience…into the cameras…into homes all over the planet. I am still seeing stars. Kate Blanchett in Armani Privé. I liked the design alright but the color just washed her out. I adored her acceptance speech for the best actress win though. Strong female leads in film sells tickets Hollywood…hear it, learn it….live it. Naomi Watts in Calvin Klein. This one really surprised me. Naomi Watts is one of my “go to” people on the red carpet. She almost NEVER appears on the red carpet in anything other than stunning. Last nights efforts, while not horrible, just left me kind of “meh”. It was too much of a one note for me. Jessica Biel in Chanel Couture. I do not feel this dress did ANYTHING for her. When pressed, the only compliment I can give this gown is to say “ well…it was beaded” In the words of the indomitable Miranda Priestly from The Devil Wears Prada “That is all”. And….I know I will get all kinds of disagreement on this one…Lupita Nyong’o in Prada. I adored this color on her and the whole flowing Grecian look. I just could not get past my first impression of her and my exclamation of “It’s Cinderella!” The headband had to go if I was ever going to get Cinderella out of my head. Bippity, boppity boo. 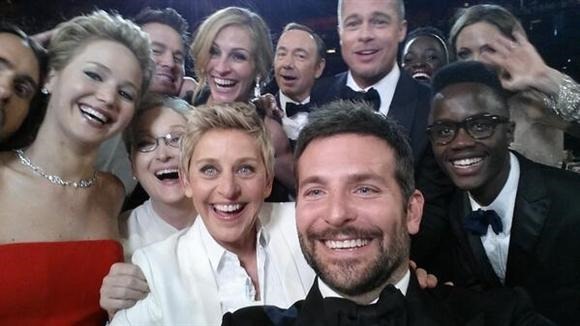 All in all not a bad turnout for fashion on the red carpet last night and also of historic significance…the selfie that shut down twitter last night from Ellen DeGeneres.